How many times have your children told you about:”Mommy/daddy can we have a dog? Can we have a cat? Could we have any pet?! It is common for younger children to ask their parents for an animal, and if they agree, parents should make this choice responsibly, explaining their children that an animal is not a toy, but a living being that also needs care. Having an animal in the house can bring children, and the family in generates many advantages and benefits if it is not a decision made on a whim. For children, the benefits we talk about range from physical, psychological, emotional and social to educational. 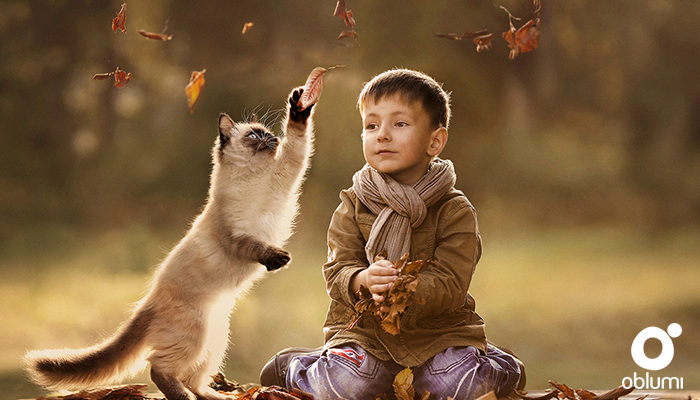 Children who care for a pet learn something fundamental: the importance of love and respect for animals. This will have very positive results in the social sphere of the child, as a child who learns to take care of an animal, treat it with love and patience, it could serve in the future to relate to his or her environment in a safer, more respectful and loving way with other people. In other words, child will be a person more inclined to develop not only cognitive intelligence, but also emotional intelligence. Emotional intelligence is the ability to understand, manage and express in a clear and effective way our feelings, and interpret those of other people, and has been considered for years as a key to the harmonious development of the quality of life of our children. In the day-to-day care of their pet, children also develops a sense of responsibility. By taking care of the animal’s primary care, such as cleaning, feeding, necessities, the child learns day after day that having an animal in the house involves tasks, which must always be respected, to maintain the welfare of our animal. In doing so, our child will learn daily a sense of responsibility, knowing how to take care of a living being that is different from him. All of this forms and educates the child by bringing a sense of accomplishment that also helps him/her to feel independent and competent, slowly bringing positive feedback for self-esteem. In order to have a good coexistence between the animal and the child, education to respect is fundamental. The child should learn not to pull hair, tail, or disturb the animal while is eating or sleeping. Child will have to learn to respect a living being with characteristics and needs different from your own. In addition, the type of relationship between the child and the animal is based on non-verbal communication. The child is through his or her own eyes, feelings and emotions with which he or she begins to communicate. This provides the child with emotional stability that can help him/her overcome a critical moment, such as the birth of a sibling. On the other hand, proximity to a pet can facilitate language acquisition and improve nonverbal skills in children. Children who play with animals implement very important communication processes. The “dialogue” with an animal occurs in a simple and natural way, the animal does not judge us, the animal welcomes us and listens to us and perhaps it is for this reason that the child, but also the adult can easily open to him and create a strong understanding. Animals can therefore offer us unparalleled emotional support, bringing the child to face the emotions that can scare the most. During an investigation, the children were asked who they would turn to in case of difficulties, and it was nice to see that most of them mentioned their animal. Pets give us unconditional support, precisely because the animal has no prejudices like humans. The last thing we learn from our relationship with our animal is the natural understanding of the life cycle. Often, it can be difficult for us parents to explain concepts such as birth or death to our children. Knowing these mechanisms can be easier for both parties through the life of animals. The death of a pet is a time of great pain, but it can also be an important learning experience. The way parents handle bereavement will teach the child how to deal with a delicate issue like death. For all these aspects that we have just enumerated is why we should respond with a strong “Yes” to the question of our children, when they insist on asking ourselves “Can we have a pet? Always keeping in mind that since we are the adults of the family, we are the last real responsible for the lives of the animals and we have to be aware of our living conditions and our daily lives.